Over 20 years of research has shown that access to affordable, healthy food is a significant challenge among low-income communities, like the City of Poughkeepsie, and that this lack of access is directly associated with increased rates of obesity and other diet-related diseases. In fact, 80% of the factors that negatively influence a person’s health are due to socioeconomic, environmental, or behavioral factors such as poor nutrition. The most recent data from the USDA’s Food Atlas showed that within every single City of Poughkeepsie ward, at least 500 people, or 33% of the population, lived more than 1 mile from a supermarket or fresh food provider. According to data from the 2000-2010 Center for Disease Control Behavioral Risk Factor Surveillance System Survey, the prevalence of obesity among City of Poughkeepsie residents has shown a steady increase over the last 10 years, with an average of 32% of residents considered obese. For this reason, the existence of more equitable models of healthy food providers is a critical component of a healthy, thriving community. Dutchess Outreach exists to widen food access, increase advocacy, and provide emergency relief by offering a range of vital services for the residents of Dutchess County while working to uncover a deeper understanding of the social ills our community faces in order to create innovative, community-minded solutions to achieve a healthier, more vibrant, sustainable community. For over 40 years Dutchess Outreach has helped thousands of women, men, and children throughout Dutchess County. Through our food pantry we provide food to families whose shelves are empty, our clothing closet provides lightly used clothes for children, our emergency relief programming ensures our clients can afford their medicine when they’re sick and that their lights and heat remain on, our community meal program, The Lunch Box, serves free hot lunch and dinner meals to anyone who needs and provides a safe space for the community to gather, and one of our newer programs, the Dutchess Outreach Fresh Market, provides our community access to affordable, fresh, locally farmed foods. The programming we offer our community is diverse in that we cover a range of vital services, however, they are all connected and equally assist us in achieving our larger mission to widen access to more nutritious foods, lower the instance of food insecurity, and increase the overall health and vitality of our community by creating a path towards a more resilient local, sustainable, and equitable food system. We envision offering a community cure through the prescription and distribution of fresh, nutritionally dense foods as well as by offering education on the importance of eating locally farmed foods for our bodies and our environment. 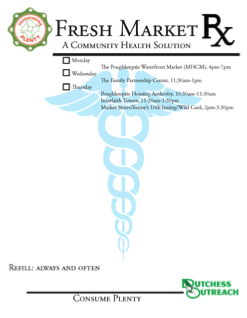 During the 2017 season of the Dutchess Outreach Fresh Market, we piloted a program offering stakeholders and anchors an opportunity to invest in the health of their community through the purchase and sponsorship of our Dutchess Outreach “Fresh Market Bucks”. Once funded, these vouchers were prescribed as part of a “Fresh Market Rx”, a community cure, by local healthcare practitioners as well as through other community health driven organizations to patients and residents who demonstrate signs or expressions of food insecurity, as tested by a short food security survey, in order to incentivize the purchase of fresh fruits and vegetables at our mobile market and to incorporate healthier foods into their diets. “Fresh Market Bucks” come in denominations of $5, packs of $100 and are issued via “Fresh Market Rx” pads, which offer healthcare practitioners an opportunity to discuss the importance of incorporating healthier foods into their patient’s diets and gives them information on when and where they can purchase these foods at our Mobile Farmers’ Market. At our market, each item of produce features a sign indicating nutrient density, vitamins, and minerals contained, and ways in which to prepare the food in order to get the most nutritional value from it. These facts also appear as postcards so shoppers can conveniently take them home with them for reference. Your net worth should not determine your ability to purchase real foods. Where you can afford to live should not present a barrier to access or limit you to processed sugar-laden ‘foods’ full of calories, void of any worth. To improve the quality of life and overall health and resiliency of The City of Poughkeepsie and it’s residents, the ability to make that choice must be present. To ensure that everyone, regardless of income, has access to fresh, healthy food, and the support they need, as our mission extends.